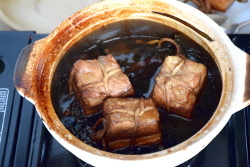 Braised pork belly or Dong Po Rou (东坡肉) is an iconic traditional Chinese braised pork belly recipe of Hangzhou (杭州), created by Su Dong Po, a famous scholar, writer, poet, calligrapher, gastronome, and court official of the Song dynasty. Over the centuries, this dish has become very popular, and once you taste it, you’ll know why! Legend has it that Dong Po Rou was created by accident. 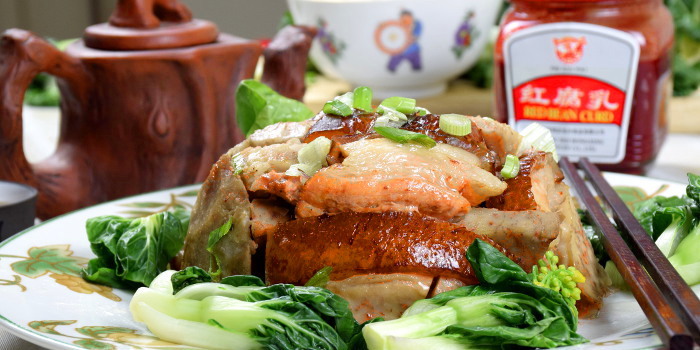 There are many versions of folklore tales about how Su Dong Po created this dish. According to one most gastronomically related tale, Su Dong Po was once the official at West Lake who had successfully prevented a massive flood. He organized a banquet to celebrate the event and ordered the chef to prepare stew pork and wine for the public who came to his house to congratulate him. The chef misunderstood that the wine was supposed to add into the braised pork belly instead of serving the guests. Fortunately, the dish that he thought had been ruined turned out to be a pleasant surprise, which was thoroughly enjoyed by the guests. The prolonged stewing with wine breaks down the fat to make the braised pork belly flavorsome, succulent and give it the tender “melt-in-the-mouth” texture. It is so tender that it can easily be separated into small pieces with chopsticks. 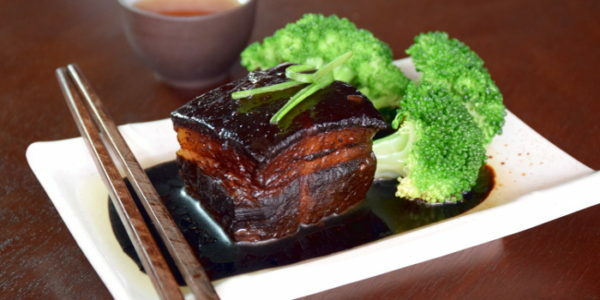 Chinese braised pork belly (Dong po rou) was thus born and eventually became the notable signature Chinese dish famous around the world. 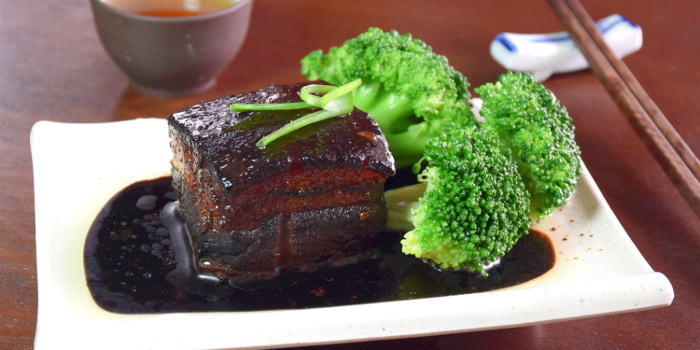 Although the braised pork belly has plenty of fat (think of bacon before being cured and sliced), the lengthily stewing over low heat results in fats sans much of its greasiness. The flavors of the accompanying spring onions and ginger help to balance the greasiness of the pork, which is so tender that it can literally melt in the mouth. Braise pork belly (Dong Po Rou) is surprisingly simple to prepare because it only involves six ingredients. You need a few hours of stewing before you can taste the fantastic evening combination of flavor and texture of the meat, which is definitely worth the wait. Cut the pork into 4cm squares. Heat up the wok, put the pork skin side down to dry fry the skin until it becomes slightly brown. Remove. 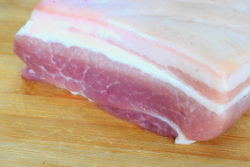 Place the pork in a pot of hot water and blanch for three minutes. Remove. Lay the spring onions in a crosshatch pattern at the bottom of a medium sized clay pot to form a thick even layer. The spring onions should cover the entire bottom of the pot. Lay the ginger slices evenly over the spring onion. 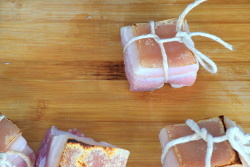 Tie the pork pieces with a kitchen string. Arrange the pork pieces skin down on top of the spring onions. Add the remaining ingredients in B into the clay pot. Bring it to a boil with the lid on. When the liquid in the pot starts to boil, reduce the heat and simmer for 90 minutes without stirring it. Turn the pork pieces skin-side up in the pot. Cover and simmer for another 90 minutes. Transfer the pork pieces to a plate. Remove the strings. Drizzle the sauce over the pork. Serve. Note: This post may contain affiliate links. I may receive commissions for purchases made through links in this post. Brown the skin to create flavor. Use the blade of the knife to remove any hair and impurities on the surface of the skin. Heat up the wok, put the pork skin side down to dry fry the skin until it becomes slightly brown. Dry frying is a way to create extra flavor, much like deep frying is for golden browning. Since the pork belly has plenty of fat, deep frying would leave it too only. Dry frying is a better approach. Blanch the pork in water. This is an effective method to remove the gamey taste of the pork. Cut the pork to 4cm square or smaller. If the pieces of pork are too big, the interior of the pork pieces will not be tender and absorb the flavor of the simmering liquid. Tie with strings. 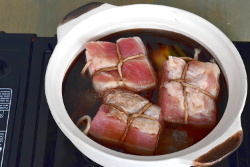 Tie the pork pieces with kitchen string to prevent them from falling apart during the long stewing process. Improve the flavor with aromatics. The aromatics form the foundation for the pork to prevent it from sticking to the bottom. The pork will fully absorb the flavor of the spring onions and ginger during the long hours of stewing. Always use premium quality soy sauce. The quality of soy sauce is very important since there are only six ingredients used in this recipe. Turn the pork pieces over once. This is important as the liquid of the stew may not fully cover the pork. Turn the pork pieces over once to ensure even cooking. Use rock sugar. Rock sugar has a very clean taste. But you can substitute it with white sugar if rock sugar is not available. Use low heat to simmer on. Light soy sauce can become bitter if it is simmered over high heat and will leave an unpleasant taste in the pork. 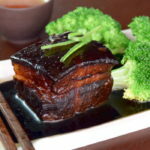 14 replies to "Braised pork belly recipe – Chinese style (Dong Po Rou)"
The recipe look very tempting to try. Nice photos. Not sure about the nutrition value of the soy sauce though. Kikkomam’s Less Sodium Soy Sauce for 5 tablespoons would be 2875 grams or 958 grams per serving. Giving it a 5 star, because any thing with pork belly is great. 1. Use light soy sauce, not the dark one. The color will turn darker after braising for some time. 2. Use very low heat. If the bottom is charred, it will leave a bitter taste. Add water if necessary along the way. Hope you enjoy your pork belly. Mouth watering! 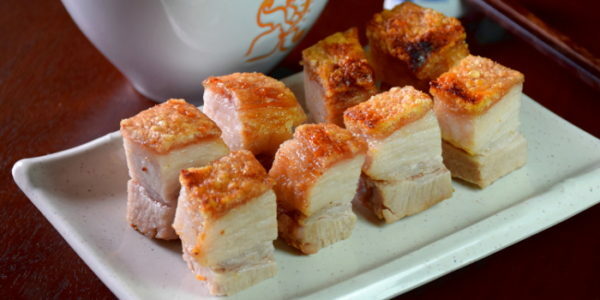 I absolutely love pork belly, and I bet this is melt in the mouth good! Yes. Melt-in-the-mouth. The important point is be patient. Low heat, long hours of stewing is the key. 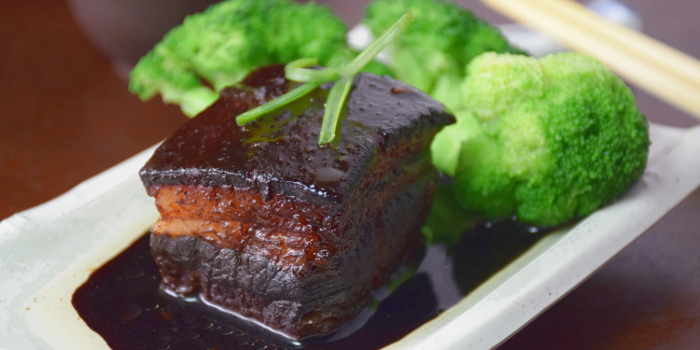 Great to know that you and your family enjoy the braised pork belly. I will try this recipe on Sunday, have made it a couple times & had it in Hangzhou at the University by the West Lake. One of my favourite dishes. 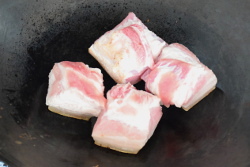 Other Dongpo Pork recipes I have tried called for blanching before browning. You are suggesting to blanch after browning the skin only, can you please confirm this? Also by ‘dry frying’ do you mean to fry with no oil or just a little oil? Thanks again & I will let you know my thoughts, I will probably substitute brown sugar & sherry for the rock sugar & Shaoxing Wine. I have made it both ways in the past & prefer the sherry & brown sugar. I believe you can either blanch it first then brown or vice versa. I find that it is a little challenging to brown it after blanching, so that is why I did that, but if you have done the other way round without problem, then please go ahead. 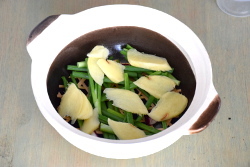 The purpose of blanching is to get rid of the ‘pork’ smell which some people may not like. Yes, I mean with little oil for ‘dry frying.’ You know that English is not my primary language so I hope you understand what I mean. I am just like you, like to substitute items that are available locally. Brown sugar should add some flavor to the Dong Po meat and should be a great substitute.